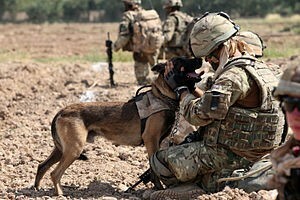 What is a War Dog? 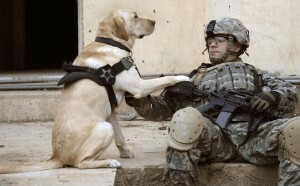 om ancient times to present day, Canines have been on the forefront fighting and working side by side with our soldiers. During the World Wars not only did they fight with the soldiers, but they also helped with the injured. War Dogs were trained to pull carts carrying wounded soldiers from the front line to the medical centers, as well as a courier carrying small messages from one handler to another. Fast forward to present day and now they do something a little different; they are still working with their handlers, but are now trained to detect bombs, track fugitives, scout out an area, and do police work. adoption. Dogs deemed as unfit for adoption are euthanized. But, there wasn’t always an adoption option – in 2000, congress passed Robby’s Law, which began allowing handlers to adopt their working dog after it was discharged. Then, in 2013, congress added to the National Defense Authorization for Fiscal Year 2013 making certain requirements for the retirement, adoption, care, and recognition of military dogs. Because of Robby’s Law, once the adoptable dogs are discharged from active duty, the former handlers have first priority in taking them home. If the handler cannot take the dog for any reason, the police force gets second priority, and civilians get the third. The biggest challenge isn’t getting the approval to take them home, but the funding to send them home. This is where the United States War Dogs Association comes in – with the help of many donations, they not only provide the funds to transport them home, but also the basic necessities such as bedding, food, leashes, and toys. Who is the United States War Dogs Association? 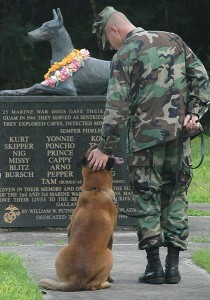 States War Dogs Association is an organization of former and current military dog handlers and other individuals committed to promoting the long history of military service dogs, establishing permanent War Dog Memorials, and educating the public about the invaluable service of these canines to our country. United States War Dogs Association was created to support and help not only past War Dogs, but also dogs currently on deployment. They rely solely on the donations and 100% of all proceeds go directly to the war dogs. This entry was posted in Animal Shelter, Dog, Dog health, Dog Training, Exercise, Humane Society, Nose Work, Pet Events, pet ownership, Pet Services. Bookmark the permalink. Come rain or shine, 365 days per year, we always have staff here caring for our furry guests. However, during select holidays we give our front desk staff time off to be with their families. Therefore, our Lobby is closed for the following holidays: New Year’s Day, Easter Sunday, Memorial Day, Fourth of July, Labor Day, Thanksgiving Day and Christmas Day.